How often do you eat? Every 2 hours? 3? or do you eat indiscriminately throughout the day? Maybe you just eat when your hungry. How do you stoke your furnace? Stoking the furnace is more important on focusing on overall calories and not meal frequency. There will be devience if you are enhanced or not enhanced in this equation because of an increased P-Ratio if you are "Taking Gear" and those who are not. At the end of the day your total caloric intake is what is important and meal frequency should be of lesser importance. That is not to say pre/intra/post are still very important for optimal performance. But there is research showing less meals (4) are better then 6 for Muscle Protein Synthesis. They found that having high quality protein available (20-40 g depending on body size) within two hours post-workout will maximize the anabolic response. Now, how much difference it will make on overall muscular growth is very slim, because the findings didn’t quite reach statistical significance. Further, they found that you don’t necessarily have to drink that protein shake directly post-workout (as often advertised). If you ate a large meal including a lot of protein 2-3 hours pre-workout, you already have protein in these amounts available to maximize muscle protein synthesis post-workout. They also looked at the timing of carbs, and even though they lack data to form any concrete recommendations, the assumption can be made that carbohydrate availability before, during and after exercise is of greater importance for endurance as opposed to strength or hypertrophy goals. Furthermore, the widely claimed notion that you should combine protein and carbs post-workout for optimal gains have been challenged by recent studies. Found that adding carbohydrates in quantities of (0.15, or 0.6 g/kg/hr.) post full body resistance training to amplify the protein intake didn’t increase whole body protein balance during a 6-hour post-exercise recovery period, compared to the protein-only treatment. 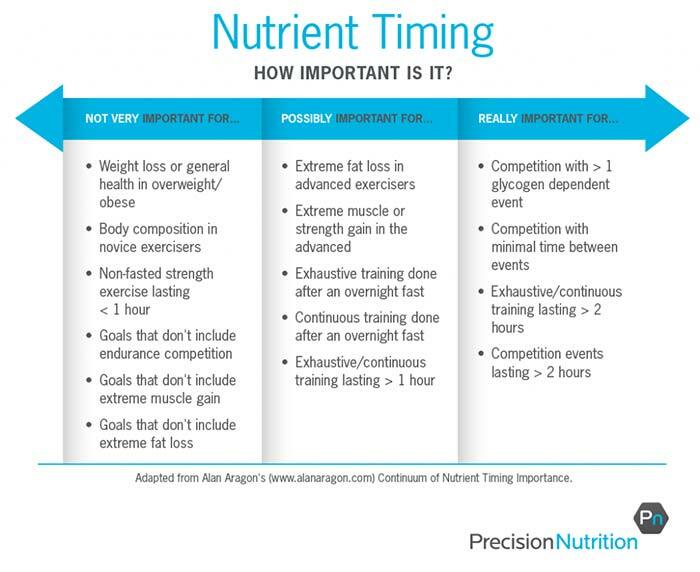 Nutrient timing and meal frequency is much less important than the previous steps of calories, macros and micros. Timing of nutrients (protein) around training maximizes anabolic response. However, the benefits are small and if food is ingested in medium to large quantities anywhere within 3-5 hours around the workout, muscle protein synthesis will be maximized. 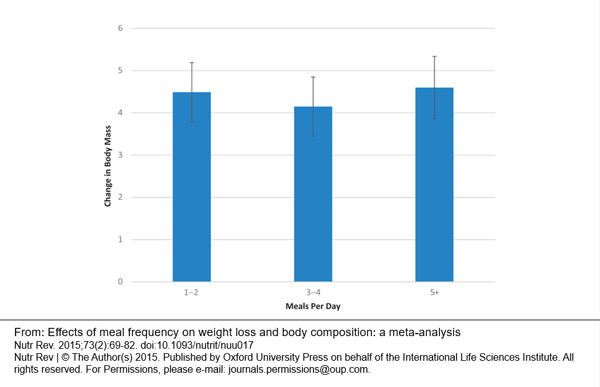 For the average person, there seems to be no significant difference on body composition between different meal frequencies. It might be for more lean and muscular individuals. Follow a nutrient timing and meal frequency that you enjoy and can stick to. DAMN BONES! Thanks for taking the time brother! GREAT STUFF! I´ll just post up this meal plan from somewhere in the middle of my last contest prep. Great to know how the pros do it! Hey Rex really cool of you to share this with us! Thanks! I appreciate you thanking me. You are very welcome, Spartan. You sleep from 5am until noon? I just shove food in my face at every possible opportunity. Today I had a quick shake just before work, and now 5 hours later I’m getting my first break and having some eggs. Chicken for lunch...Greek yogurt on the next break if I have time to take one - if not, after I get off work. There’s no way that I can eat at exact times like some of you guys! I have a lot of clients like that in similar job situations. When I was in clinical I used to load bottles of meal replacements in my lab coat. they were 20g fat, 45g carbs, 30g protein. I would pound them in the bathroom! I used to eat every 3 hours on the dot whether I was hungry or not, now I eat more instinctively listening to my body. Mine depends on what periods I teach and what period I have for planning. Currently, I eat breakfast at school (7:15am), then a snack meal at the end of first period (9:15am), lunch around 11:30am, then a meal after school, after football practice, then something near bedtime. If I am training after practice I eat a smaller meal near the end of it and a protein shake during my workout. Next semester planning moved to second period and lunch to second lunch which gives me a better schedule for eating. My meals can be a bit closer to 3 hours inbetween and I wont have to have a snack meal, instead have a full one. Spoken like a true educator! You probably feel better too right? My experience has taught me this: if you're going to eat larger meals, they need to be consumed 3-4 hours apart depending on metabolism. If the meals are smaller, than every 2-3 hours should keep your metabolism and appetite going. To the OP's question, I personally eat every 2-3 hours. The key is not overindulging in carbs and my body responds amazingly! I personally believe most eat way too many damn calories. You see far too many lifters with beer bellies these days.....TOO MUCH FOOD! Portion control is critical. I too am of that opinion Beast. ELEMENTARY MY DEAR WATSON!! LOL!! Feed it what it needs in the right portions. The body works more efficiently.